Internews has been working in what is now South Sudan since 2006, building some of the first community radio stations in the country, and providing communities in remote, information-poor areas with vital access to news and information in local languages. The Radio Community, an expanding network of local radio stations in local languages, reaches an estimated 2.1 million potential listeners. These include Mayardit FM in Turalei, Akol Yam in Aweil, Singaita FM in Kapoeta, and Mingkaman FM in Mingkaman. Stations in Leer and Nasir are currently off air due to conflict. Internews supports Eye Media, a 100% South Sudanese NGO, to operate Eye Radio, a Juba-based news station. Eye Radio’s national network expansion will soon see the station broadcasting across 10 state capitals of South Sudan, creating the country’s first independent 100% South Sudanese national radio network. Internews and the University of Juba launched a state-of-the-art media resource center and radio lab in 2015, while also developing a practical diploma course, ensuring a new generation of skilled journalists. Internews also supports the foundation of the Media Development Institute (MDI), a South Sudanese training institution for current journalists. Internews supports local institutions and works to improve normative-legal-regulatory conditions and foster a free and open media. Internews supports the Union of Journalists of South Sudan (UJOSS) and the Association for Media Development in South Sudan (AMDISS), to provide specialized training to media lawyers, and training for journalists on media laws. A small grants program for local South Sudanese organizations provides opportunities to explore and develop new initiatives. In 2016 it included 11 grants to support South Sudanese websites, newspapers, radio stations, drama festivals, Tech Labs, law seminars and youth magazines. 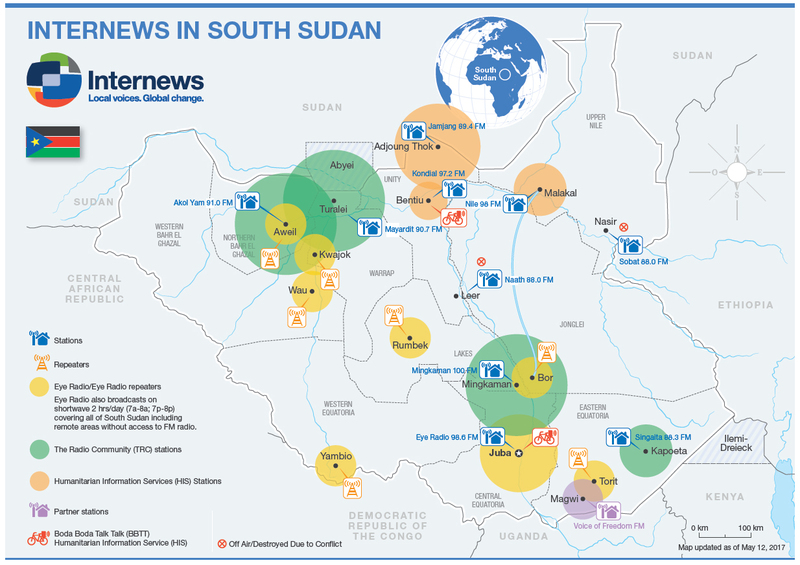 Internews has used its global humanitarian experience and knowledge of the South Sudan context to provide lifesaving information to communities in need. Interventions range from emergency “Radio-in-a-Box” kits, to hyper-local projects such as “Boda Boda Talk Talk,” an audio information program which is played for community audiences via a system of mobile speakers. These projects currently operate in UN Protection of Civilian sites in Juba, Bor, Malakal and Bentiu, providing vital information in areas where more conventional media may not be able to reach. In 2016, Internews launched a community radio station for more than 100,000 Sudanese refugees in need of information in Yida and Ajoung Thok in northern Unity State. Internews also provides advisory services on Communicating with Communities (CwC), supporting training and advocacy that highlights the critical importance of communication with communities in promoting accountability within the humanitarian sector. Internews has worked with local partner Forcier Consulting to conduct media research for the entire sector, including National Audience Surveys in 2013 and 2015, the development of an audience rating system and market assessments. Internews’ work in South Sudan is funded by USAID through the i-STREAM project (Strengthening Free and Independent Media in South Sudan). Internews South Sudan also receives funding from the Common Humanitarian Fund (CHF), the Central Emergency Response Fund (CERF), World Vision through UKAid’s Disaster Emergency Preparedness Program (DEPP), and the US State Department’s Bureau of Population, Refugees, and Migration (BPRM).